In accordance with Regulation (EU) 2016/679 of the European Parliament and of the Council of 27th of April, 2016 on the protection of natural persons with regard to the processing of personal data and on the free movement of such data, and repealing Directive 95/46/EC (General Data Protection Regulation) which came into force on May 25, 2018 in all countries as well as the Law on Data Protection (Official Gazette of RS No. 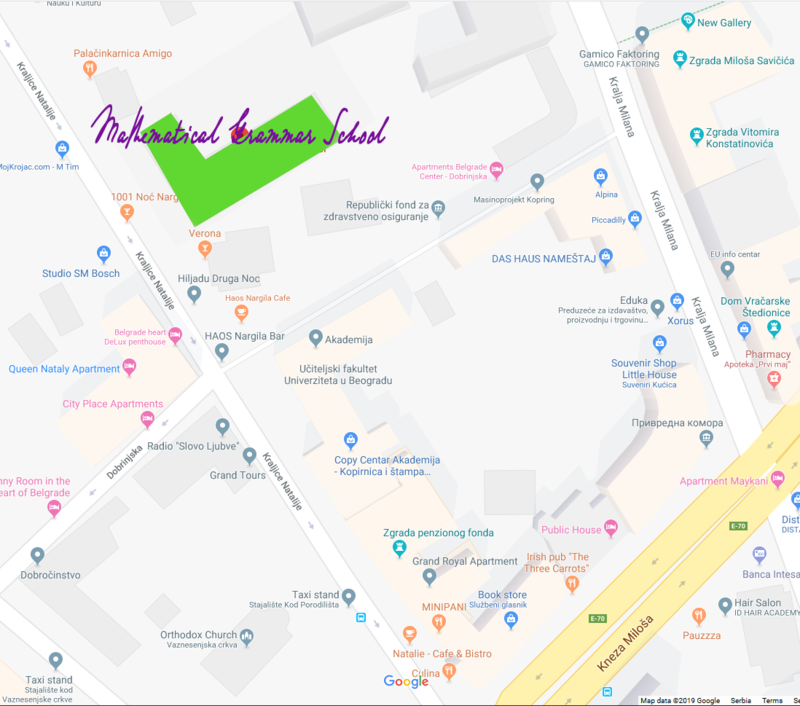 97/2008, 104/2009 - other law and 68/2012 - US decision), respectively in accordance with the legal framework for the protection of personal data in the Republic of Serbia and the European Union, Mathematical Grammar School in Belgrade, Kraljice Natalije37, processes personal data necessary for examination before admission to the first grade. Data Protection Policy informs users about their rights when their personal data are collected and furtheron processed in order to protect their privacy. Data Protection Policy is based on the following principles of processing personal data: the principle of legality, transparency and best practice, the principle of limited processing and reduction of data, the principle of accuracy and completeness of personal data, the principle of integrity and confidentiality of data, the principle of responsibility, the principle of trust and fair processing, the principle of opportunity (processing purposes), the principle of processing in an unnamed (anonymous) form. The Mathematical Grammar School is responsible for processing personal data. Privacy is protected. The collection, keeping, processing and use of personal data is carried out in accordance with the Law on Personal Data Protection ("Official Gazette of the Republic of Serbia", No. 97/08, 104/2009 - other law and 68/2012 - US decision). Personal data will not be used for purposes for which they were not collected, except for conducting court proceedings or for protecting the security of the Republic of Serbia, in the manner prescribed by law. All necessary data protection measures have been taken in accordance with established standards and procedures, which are necessary to protect data from loss, destruction, unauthorized access, alteration, publication and any other misuse. The information collected is not provided for inspection or to be exchanged with other organizations outside the system of preparing and editing the Portal, except in the cases provided for by law. The data will not be used for purposes that are not in accordance with the law or in any other way that could be harmful to users, including their privacy. Users have the right to revoke the information given in accordance with the Law on Personal Data Protection. We collect personal information through online forms voluntarily filled by the users (Cup participants) on the Site solely in order to organize an international competition under the name "Mathematical Grammar School Cup". A cookie is a small file with data transmitted from the Portal to your computer's hard disk. The Portal sends a cookie when you visit it. A cookie can not read personal information from your hard disk or read cookie files created by other sites. The information that a cookie can contain is the one that you have supplied yourself. Accepting cookies used on the Portal allows us to get information about your search habits, which we can use to personalize your performance and to set up user model patterns. This is done in order to determine the usefulness of information from the Portal for users and to determine the effectiveness of our navigation system when helping users to access this information. Cookies are generally classified as cookies "sessions" or "permanent" cookies. Cookies are not stored on your computer after you close the browser. Permanent cookies are stored on your computer until you delete them or until their expiration date. Users have the ability to accept or reject "cookies" via internet browser settings. By turning off and / or blocking cookies, users can still view the Portal pages. However, there is a possibility that the time required to access certain Portal functions will be longer than usual. Personal data is collected by the Mathematical Grammar School so that it can organize the Mathematical Grammar School Cup. Teams are formed by country, city and school data. Postal address and school address are required so that the Mathematical Grammar School can send a printed publication about the Cup to participants, if published. The date and time of arrival and departure, as well as means of transportation, are necessary for organizing team reception and organizing transport from the airport to the place of accommodation and vice versa. Leader information (name, gender, date of birth, passport number) are required by the organizer (Mathematical Grammar School) for contact, hotel / hostel where the team will be located and for Police records since the organizer is obliged to report that an international competition will take place and report participants for picnics and excursions. The e-mail and mobile phone number are needed by the organizer for contact. The leader's name and surname are also placed on the Cup Website. Photographs of the Cup participants will be placed on the Cup Website, as well as on the Cup Facebook page. Also, the media are allowed to record in order to make reports concerning the Cup. Information about the competitors (name, gender, date of birth, passport number) are required by the organizer (Mathematical Grammar School) for team building, by the hotel / hostel where the team will be located and for Police records since the organizer obliged to report that an international competition will take place and report participants for picnics and excursions. The competitor's name and surname are also placed on the Website (on the particpating teams page, as well as on the pages where the results are announced). Photographs of the Cup participants will be placed on the Cup Website, as well as on the Cup Facebook page. Also, the media are allowed to record and make reports related to the Cup. The Mathematical Grammar School uses data exclusively in order to organize the competition. Data with the names and results of the competition are stored permanently on the MGM Cup Website (MGSC) where the results from previous competitions are also set. The data entered by filling out the online form is located on the provider's server (Eunet) where the Website of the Cup is located. Information from the server is taken over by the Mathematical Grammar School. This information is taken over, processed and stored by the Mathematical Grammar School in Belgrade, Republic of Serbia. Data stored on the server are stored for up to six months. The provider on whose server it is located is responsible for its safety. c) when personal data is illegally processed. If the user's personal data are processed for marketing purposes, the user has the right to file an objection to processing for marketing purposes at any time. The Portal examines procedures on a regular basis to protect user's personal data from unauthorized access, accidental loss or destruction. Users should be aware that communication over the Internet, in terms of email and web communications, is uncertain. The very nature of the Internet is that data can go through internet connections in many countries before it is delivered. Any use of the Website is subject to the terms and conditions described on this page. The Mathematical Grammar School reserves the right to amend this Policy at any time, without giving any special notice to users. For this reason, it is recommended for all users to check the content of this Portal page regularly in order to be update with the latest valid content of this Policy.